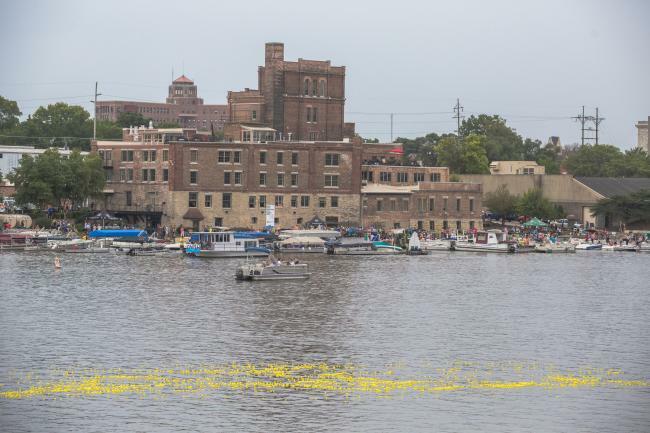 Members of the Rockford Area Convention & Visitors Bureau (RACVB) are excited to be a part of the Rock River Anything that Floats Race (RRATFR) Committee for another year. There are countless reasons to love the RRATFR including the many ways to participate in race day fun. I don’t know about you, but I have never crafted my own boat, canoe, kayak, or raft. I try to stick to water crafts that won’t sink! My efforts to support the RRATFR are better on land. This way there will be no causalities from a poorly built raft. However, as an extremely competitive person, I want to be involved in the competition aspect of race day activities. Luckily, I can race my duck! No, no, no, not a real duck, but a little rubber duck! 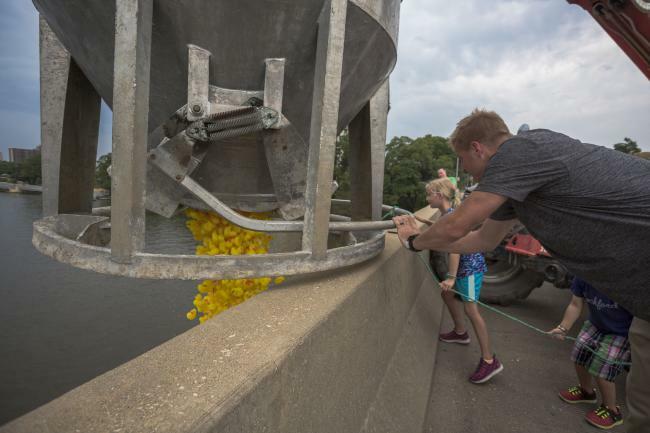 The RRATFR will hold their annual Chuck-a-Duck Race at 3:30pm, after the raft race, on August 12, 2018. Chuck-a-Duck is a fun, exciting way to get involved in the race while keeping two feet on land. How does Chuck-A-Duck work? Glad you asked! All ducks are loaded into a large crate on race day and carried to the Whitman Street Bridge. 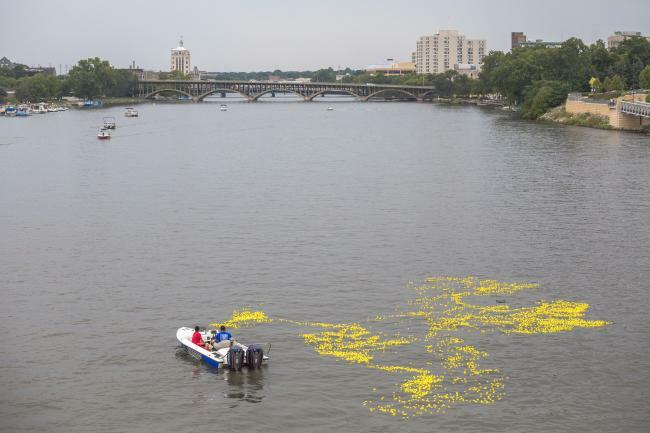 After a countdown, the ducks are released from the crate and drop into the Rock River. The ducks then float their way down the river until they reach the Prairie Street Brewhouse. The first twenty ducks to cross the finish line, win a prize. Well, the ducks don’t win the prize, YOU win the prize! 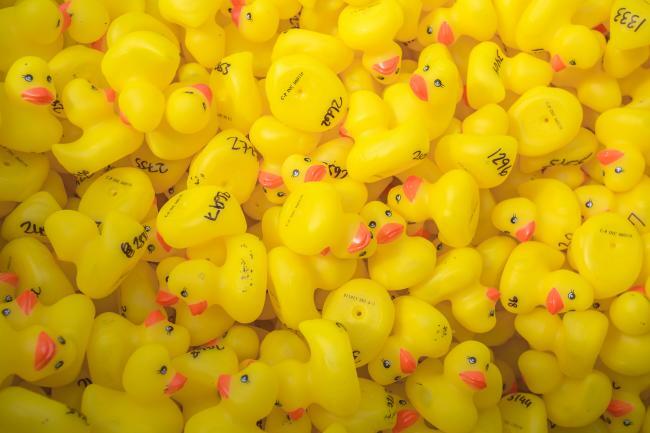 Each duck has a number written on the bottom that corresponds to the name of the duck’s owner. So, while putting in no work at all, you could win a cash prize of $1,000, $500, or $250 or other valuable prizes! Where can I get my duck? Excellent question! Ducks can be purchased all over Rockford. Of course, ducks will be sold on RRATFR day, but if you want to think ahead, ducks are sold at City Market at the B-103 Radio Station booth, Prairie Street Brewhouse, BMO Harris Bank Center Box Office, the Rockford Area Convention & Visitors Bureau office and all Rock Valley Credit Union locations. Ducks are sold for $5 each, but don’t let your duck float alone when you can purchase five ducks for $20! For every you duck you purchase, the better chance you have at winning one of the prizes. Ducks can be purchased by anyone and would also make a great gift! 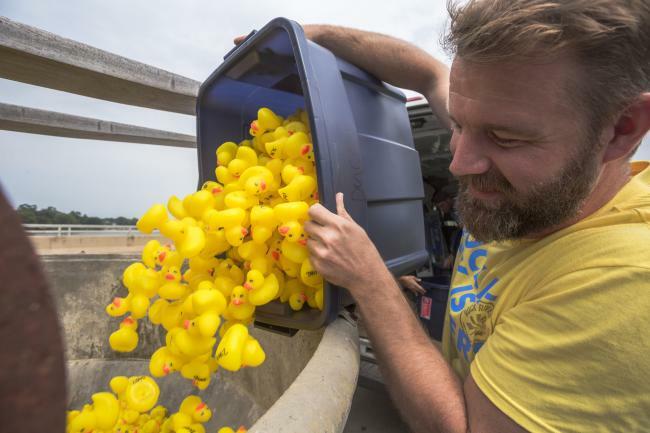 Even if you are building a raft with your crew, you can be an overachiever and purchase ducks too. Besides, if your raft doesn’t win, you can always fall back on your faithful duck. Buy your ducks today!